The Amazon Wine launch is for delivery to 12 states only – California, Connecticut, Florida, Idaho, Illinois, Iowa, Nebraska, Nevada, North Carolina, Oregon, Washington, Wyoming and the District of Columbia. More states are to be added soon, but not Tennessee. “It may be happening in other states, but the way Tennessee’s law is right now it would not be allowed under the current statute,” says Keith Bell, assistant director of the Tennessee Alcoholic Beverage Commission. When ordering wine through the website, a consumer is buying directly from a winery, according to Amazon. Each winery operates under its own set of permits and determines to which states it can ship. Wineries using Amazon Wine are only able to ship to a limited number of states. Both the purchaser and the recipient of wine must be at least 21 years of age, and all shipments require an adult signature at delivery. The shipment won’t be delivered if an adult isn’t available to sign for the delivery. Although consumers in Tennessee are unable to buy wine from Amazon, local wineries can sell their products out-of-state through the website. But local winery owners are not exactly jumping at the chance to do so. “Arrington Vineyards will not be selling wine through Amazon.com,” says Kip Summers, president and winemaker at Arrington Vineyards in Arrington. “Amazon’s forays into selling wine haven’t been stable, with several stops and starts because of the maze of state shipping regulations and restrictions throughout the USA. “Also, Amazon is essentially receiving a marketing fee while the winery does all the work. From what little I’ve read about it, the fee is very costly and one wonders who is going use Amazon’s services since all they are actually doing is marketing. Founded in 2005 by country singer Kix Brooks, Arrington sells an estimated 12,000 cases of wine each year. Like all Tennessee wineries, the company has to use a wholesaler to sell wine off-site, and is expressly prohibited from acquiring its own wholesale license in order to do so. Wineries also are prohibited from charging for on-site tastings, but are required to pay state taxes on each gallon of wine given away. Tennessee wineries can ship wine out of state. At Arrington, about 85 percent of its annual sales are either on-site or shipped from the winery to consumers. “We have people from all over the U.S. purchase our wines,” says Christel Foley, Arrignton Vineyards vice president. So while all wineries can ship out, not all wineries can ship in. 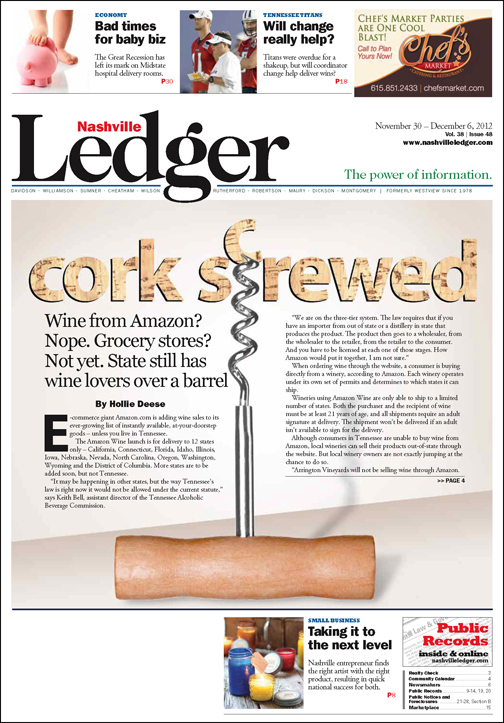 To ship wine to Tennessee consumers, a business must obtain a direct shippers license. Direct shippers licenses are available to businesses that have a federal basic permit under the federal Alcohol Administration Act and are in the business of manufacturing, bottling, or rectifying wine. Out-of-state wineries have been allowed to send products to Tennessee consumers since 2009 when then-Gov. Phil Bredesen signed into a law that allowed direct shipment of wine to Tennessee consumers – up to three cases a year. Wineries from other states have to apply for a shipping permit from the Tennessee Alcoholic Beverage Commission, pay a one-time $300 fee and an annual fee of $150. So far, 500 such permits have been granted. “There is a limit to the quantity, but you can purchase wine from California and those California wineries have a permit with us, a direct shipping permit which allows someone to order wine from the winery in California,” Bell says. So while consumers can’t order a bottle of Francis Ford Coppola Syrah from Amazon Wine, they can order it directly from the winery from their website. What wasn’t clarified in that 2009 bill was whether specialty wine retailers – not wineries – could also ship products to Tennesseans. “So far, specialty retailers can’t really get permits to ship wine in,” says Rick Jelovsek, a consumer advocate and wine educator in Johnson City who runs the website tnwinelovers.com. “In practice, however, once the winery permit law passed, a lot of the retailers said they were going to go ahead and chance it and ship it. So there is a 50 percent chance you can still get it,” he adds. Why try? Because there are just so many options available in the world to try, as long as you don’t live here.